You've seen them in the news and on TV talking about speed cameras in Maryland and DC, and may have believed that AAA has been hard at work defending motorist's rights on this issue. If so we are sorry to have to break it to you, but the truth is that AAA is an insurance company which supports and lobbies in favor of speed cameras. AAA testified IN FAVOR of statewide speed cameras in Maryland in 2009. "On behalf of our approximately 900,000 Maryland members, AAA Mid-Atlantic supports SB 277, which would expand the authority to use speed monitoring systems statewide and would add the authority to use them in highway work zones." wrote AAA Mid Atlantic in their 2009 testimony. AAA also opposed the repeal of speed cameras in 2013, side a public hearing next to representatives of one of the most troubled local speed camera programs in the state(Forest Heights), and in opposition to motorists who came to support repeal, to support the continuation of Maryland's speed camera law. SEE THE VIDEO ON GENERAL ASSEMBLY WEBSITE OF 2013 SPEED CAMERA REPEAL BILL TESTIMONY where AAA sided against motorists and against the speed camera repeal bill. 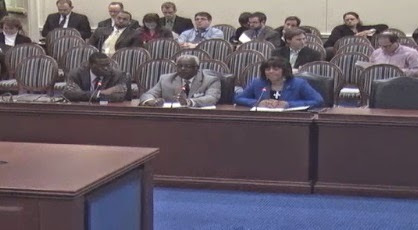 AAA's team of three lobbyists start their testimony in opposition to repeal at time index 2:43:00. In fact AAA didn't just jump on the speed camera bandwagon after the fact, they were helping to pull the wagon. All the way back in 2002, AAA Mid Atlantic's Lon Anderson bemoaned that speed cameras had not been authorized by the legislature at that time, and stated to the Gazette that AAA had testified in favor of those bills. "If this legislation had been enacted ... we could have had a model program in the nation" stated Anderson. If Lon Anderson and AAA had their way, Maryland wouldn't have gotten its first speed cameras in 2007... we'd have gotten them five years sooner. The vote on statewide speed cameras in 2009 was VERY CLOSE in the state senate, down to just a few votes. If AAA had come out strongly against this, rather than providing political cover with their support, we would likely not have statewide speed cameras in Maryland today. In fact Lon Anderson took credit for Maryland's Statewide Speed cameras being enacted. When speaking with Washington Post's Dr Gridlock in 2010 Lon Anderson said : "I worked hard to get the speed camera law passed in Maryland, and the red light camera laws reinstated in Virginia." We know some of you may be surprised to hear this. But then how would AAA representatives be able to go on TV to complain about how badly Maryland's speed cameras have been administered if they hadn't worked to put them there in the first place? AAA continues to claim that they do not oppose speed cameras. AAA's John Townsend was quoted by WTOP stating "We aren't against speed cameras. We have worked with Montgomery County and Prince George's County to make sure they have a camera program that is valid, earnest and based on integrity and fairness" so there is no basis for assuming their support for speed cameras has changed, and they have been giving PRAISE to the press about the Maryland speed camera programs which they have supported legislatively. Because Lon Anderson told the Post in 2010 that they had lobbied for speed camera in Maryland and red light cameras, we wondered whether they would support speed cameras in Virginia as well. AAA told one motorists that because there is not currently legislation pending in Virginia at this time, they therefore have not taken a position. However it is inevitable that such legislation will be considered in Virginia sooner or later, and AAA's reply seems to leave open that they could support speed cameras when (not if) the matter is brought up in that state. We asked Lon Anderson by email on September 9th "Will AAA Pledge NOT to support speed cameras in Virginia, should they every come before the legislature?" To date we have received no response from Lon Anderson regarding that pledge. motorists should not rely on AAA to speak for them. The fact is AAA is just another insurance company which happens to sell vacation packages and amusement park tickets. They simply occasionally use speed cameras for PR and as a way from distracting their members in other parts of the US from their vastly inconsistent lobbying positions on motorist rights. The reality is they are a big part of the reason Maryland has speed cameras today. Motorists who want an organization which will consistently fight to defend motorist rights should dump AAA and join the National Motorists Association. In 2013 AAA also helped organize a secret speed camera meeting, which members of the public and the press were barred from observing. AAA assisted in planning the closed event, in coordination with the heads of Maryland's biggest county speed camera programs, which included training representatives from local speed camera programs in how to conduct public relations, how to conduct media campaigns, and also discussing upcoming legislation. And now in 2014, AAA has sold out on the cheap on speed camera reform. We've talked about why this bill is a fraud at length already, and we hate to beat a dead horse. Yet AAA failed to demand stronger reforms. AAA took the position that what was needed was merely to "change the public perception" of speed cameras when what was need was to change the REALITY of speed camera programs. They lent their credibility to a reform package which was designed to be ineffective and loaded with loopholes, and which was written by local speed camera programs for the purpose of changing nothing while letting lawmakers seeking re-election claim to have voted for reform. AAA has praised a bill which did not contain audits of speed camera programs and provided no outside oversight of speed camera program. They cheered for "reform" which did nothing to relieve systematic due process violations taking place at speed camera court hearings and did nothing to restore the constitutional right to face an accuser. And they approved of a bill which wrote into law that it is OK for 5% of speed camera citations to be issued in error. Before this bill was passed public officials in the wake of Baltimore's speed camera error scandal were saying they should have a "zero error" program. How the hell does it make things better to go from that to writing into state law that having up to 1 in 20 citations issued in error is OK? Fact is the new law does little or nothing to address the issue of speed camera errors which brought about calls for reform in the first place, and trying to sugar coat that while lowing the bar for accuracy could actually make matters even worse. 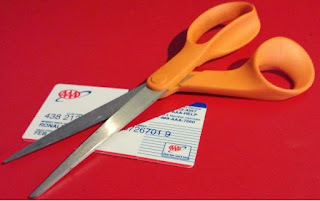 AAA was fully aware of the weakness of the reform bill which was passed. In supporting this bill anyways, AAA has provided support to a program which continues to be broken and corrupt to this day, and which is arguably even more corrupt for having yet another lie piled on top of all the old lies. AAA did have a choice. They could have supported stronger reform bills (like a more credible reform bill offered by Delegate Jon Cardin this year). Or AAA could have told the sponsors that if they wanted the organization's endorsement they must add amendments requiring outside oversight and enforcement mechanisms and closing the known bounty system loopholes in the bill. AAA did not do this. As a result the house committee leadership felt quite confident going into the legislative session that they could get away with offering a weak unenforceable reform bill as a "take it or leave it" proposition because AAA would cover for the bill sponsors. With AAA claiming to speak for drivers and blessing the bill, negotiating with the actual speed camera critics who raised the issues in the first place would not be necessary.... and so none took place. But haven't I seen AAA complaining about speed cameras on TV? That's called "spinning the press" to be generous, but "talking out of both sides of your mouth" would be much more accurate. What AAA has been doing is collecting "street cred" as a motorist organization by posturing in front of the media, and then trading it away the first time they are offered something shiny. Of course AAA DOES have a dog in this fight, but it is not the one you think it is. AAA is one of the largest sellers of insurance in the US. Don't believe us? Just google "AAA Insurance" for yourself. That is their single biggest financial interest. AAA's insurance division, California based "Auto Club Enterprises Insurance Group", collects over $2billion in insurance premiums per year. The funny thing about photo enforcement tickets in California (and some other states) is that there camera tickets come with "points". "Points" raise insurance rates... and as a result increase profits for insurance companies. But perhaps more substantially, having a large financial interest means AAA has legislative interests other than defending motorist rights. Sometimes the legislative interests of the insurance industry coincide with those of motorists, but other times they are in conflict. Or they may just need a bargaining chip. Guess where that leaves motorists? And AAA does have an INTIMATE relations with the auto insurance industry. "The Auto Club Group" (AAA) is a member of the IIHS, and in the past a representative of AAA has even chaired the IIHS. The IIHS does extensive lobbying for the insurance industry and is the biggest promoter of photo enforcement other than the camera companies and local governments which profit from it. Of course in order to support claim that "we support speed cameras if they are done right" they need to suggest that "doing it right" is possible. And so at times AAA has praising photo enforcement programs run by the SHA and Montgomery County. Holding these programs up as "model programs" is where AAA has shown their willingness to ignore reality. Invented the practive of allowing manufacturers to certify their own equipment, whereas state law requires cameras to be certified by an "independent" lab. No refunds were ever issued, and the SHA's taxpayer funded attorneys have defended the practice. Brazenly defends the practice of deploying "workzone" speed cameras in workzones with no actual workers. Flunked an internal audit which revealed the SHA failed to follow their own testing procedures and procurement policies. And oh yes, the SHA arranged it so their program would be COMPLETELY EXEMPT from ALL changes under the so called "speed camera reform" law. Routinely prevented motorists from cross examining the actual operator of a speed camera in court, even when specifically requested. Montgomery once even demanded a $43,000 fee to satisfy a request from our organization for public records pertaining to this practice. Was revealed by our website in 2010 to have skipped daily calibration logs (a requirement of state law). No refunds were ever issued. Vigorously defended their right to issue citations to people who are innocent as a matter of fact because they were not even driving the vehicle, and put misleading information on their citations about the meaning of the law with respect to a ticket recipient's recourse if they were not driving. 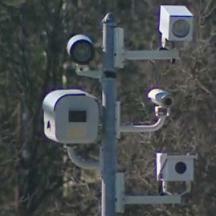 These are the "model" speed camera programs in Maryland. "In theory" these are the best Maryland has to offer, the programs the so called "reform bill" was supposed to have been modeled after, and the ones AAA thinks every other program in the state should strive to emulate. The scary thing is that these programs ARE a model for other speed camera programs. Other local governments have concluded that they can get away with circumventing the supposed restrictions built into state law in this same way whenever it is expedient, and have copied such practices and sometimes pushed the bar even further. AAA's multiple personality disorder when it comes to motorists rights is not limited to Maryland, nor is it limited to the issue of speed cameras. For example in 2011, AAA *supported* a speed camera setup in a South Carolina city, which was run in defiance of a state law intended to stop the program. AAA "Hoosier" (Indiana) also lobbied for speed cameras in that state, in a 2013 legislative summary they stated: "AAA Hoosier Motor Club will focus its efforts on supporting legislation that would allow for the use of speed enforcement cameras in construction zones, school zones and on the “stop” arms of school buses during Indiana’s current legislative session." AAA also supported an increase in the gas tax in Virginia, as well as supporting increases in the federal gas tax. Now don't get us wrong: roads must be paid for somehow, and gas taxes are no worse than any other way this might be done. But the position of a motorist organization should not be to call for gas tax increases to pay for "transportation" (including things other than things which benefit drivers). If that is the opening position from motorists then by the time other interest groups have had their say the deal can only end up getting worse. A motorist advocacy organization should start from a position of strength and negotiate down from there. And if taxes are to be increased in the end, they should demand that motorists (not other interest groups) get something tangible in return for every additional penny collected. Has AAA Condoned a Vehicle Mile Traveled (VMT) Tax? Would it surprise you to learn that in 2009 the president and CEO of AAA expressed support for the creation of a national Vehicle Mile Traveled Tax? This sentiment on the VMT, which was repeated in a press release, would seem to leave open the door to a national VMT tax. And in Idaho, AAA actually supported the creation of a VMT tax. "Consistent with the task force objective to 'modernize' transportation funding, the option of charging for use of our infrastructure based on miles traveled (VMT) makes sense. Much work has been accomplished in the past decade" ..... "Instead of putting off for another decade what VMT technology can do today, policymakers could begin to address fairer, more comprehensive user pay mechanisms now." stated AAA Recommendations to a Task Force on "Modernizing Transportation Funding". We have made clear in the past that a VMT Tax would be a TERRIBLE DEAL for motorists. This is not an issue where a motorist organization ought to be taking some middle-of-the-road, wishy washing "well we can discuss how to make it work" kind of position. A VMT tax would be the most invasive idea ever conceived against motorists. An organization representing motorists should not require additional study into the matter to conclude the answer to this is "NO! NEVER! ABSOLUTELY NOT!" And no amount of repackaging or spin should be sufficient to change that. That is what the National Motorists Association has said. And that is what we have said, and WE intend to stick to that position. But AAA has recently told the press that their position is that "no politician with half a brain would even fathom this". Does AAA's right hand not know what the left has been doing? And therein lies the problem: how are AAA's members to know the organization's position when ( as has apparently happened with speed cameras ) they appear to posture one way with the press, but advocate another position when talking to government officials? Can an organization which tells the press that a VMT tax is a non-starter, but in another context advocates the opposite, be trusted not to support the idea of a mileage tax if two years from now they are offered something shiny? The fact is when the issue of VMT fees did come up in the legislature this year and last year, AAA was a no-show. That does not inspire confidence. If we were talking about some other insurance company maybe AAA's positions would be OK: they are entitled to their opinion. But those organizations do not CLAIM to speak for motorists. When AAA says "we support speed cameras so long as they are done right" ( even though it has been documented over and over again how they are consistently being done wrong ) they are doing it while claiming to be a motorist organization. Of course their members probably joined to get travel agent services or hotel discounts, not lobbying support, and have no clue what AAA advocates for in state legislatures. If Motorists want their rights and their interests defended, they need to understand that they cannot rely on an Insurance company/Travel agency to do that for them. We don't need an advocate who thinks an issue like speed cameras can be used as a public relations gimmick or a bargaining chip they can trade away. Motorists need an organization which takes consistent positions and fights for them. What is needed is for drivers to unite into citizen based activist organizations. Motorists cannot afford to let AAA be the only game in town.